In stock 61 items in stock. NEED ONE FOR THE MEGA/ MEGA ADK!! Works great, Love it. Need to make one for the Mega now!! Some assembly instructions and a schematic for the work area would be nice. It isn't difficult to figure out but having to get a magnifying glass and follow the little path from ground to determine orientation for the LED combined with having to test a little before being able to infer that the tiny (-) signs indicate continuity was disappointing. I spent $15 so I could get right to making something quickly. This kit falls short by a single, short paragraph of text. Agree that the white lines could be MUCH clearer regarding what is connected. The LED orientation is indicated by the outline on the board though - the flat on the LED matches up with the flat line on the board. The current version uses flat head screws for the 3 position terminals, and a Philips head for the 2 position terminals. On the next batch can you standardize on one or the other? My batch# is 64465. Otherwise a great board. Thanks. The only change I'd ask for to this is another couple of screw terminals for the power pins. Can i wire stepper motors into this, or is it better to use the Rover 5 driver shield? I currently am using one of these on a robot for a school soccer competition. While I had this on my brand new RedBoard with a WRL-11786 and a BOB-12009 soldered to the shield, the voltage regulator on the RedBoard started overheating. I took the shield off the RedBoard and the voltage regulator cooled off. When I noticed this, I notified my teammate who soldered everything together. We double-checked all the connections, solder joints, code, and we cleared any solder debris off the shield. Same thing happened again. Turns out, using both ground holes in the board caused this. We fixed it by putting both ground wires onto two of the holes that were bridged and used a third bridged hole to connect everything to ground. We haven't had any more problems so far. Anybody have an explanation for this? 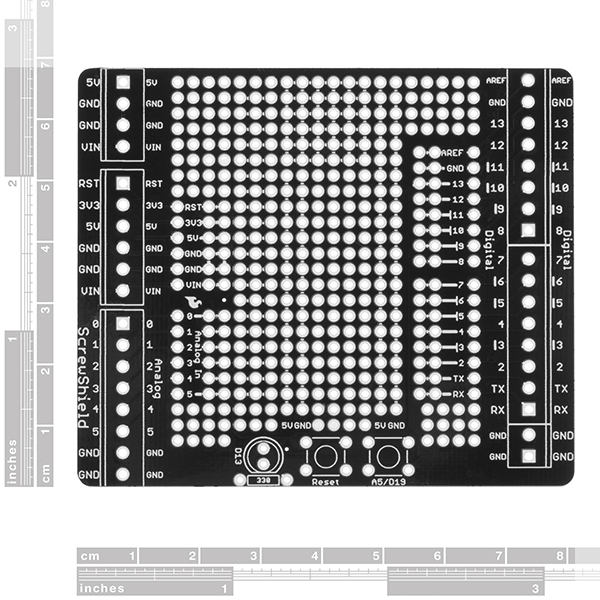 This may not be an R3 shield, but it is very handy for interfacing stuff off-board when prototyping. I combine these with the small breadboards. 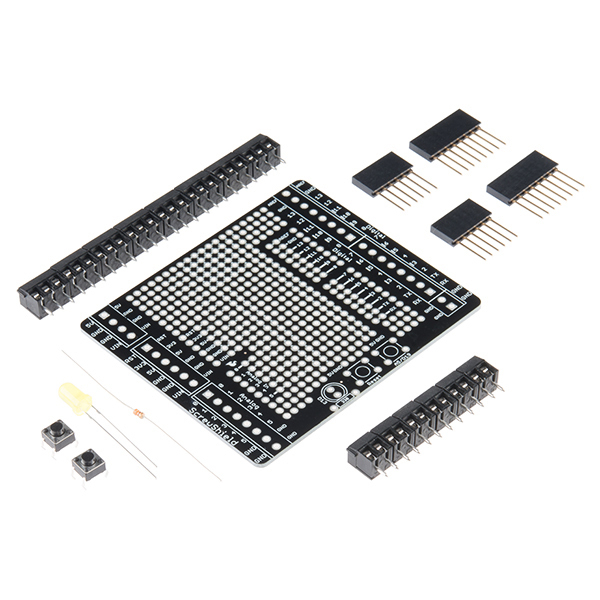 I need to build some that have extra terminals and headers, so I can have connections for things I add on the breadboard, like FETs. There is plenty of PTH space for more terminals. A Mega version would be very cool, but that would be a LOT of terminals. Sparkfun needs to be clear that this is not an R3 shield. There are no SDA or SCL headers. Wish I hadn't bought this. I assumed the headers were set up for R3. I wanted to use this for a Netduino, but without the I2C pins this thing is worthless to me. Sorry about the confusion. We do generally state R3 compatibility on any shield descriptions that are R3 layouts. Email techsupport@sparkfun and they should be able to get you set up with a return since you have no use for the shield. 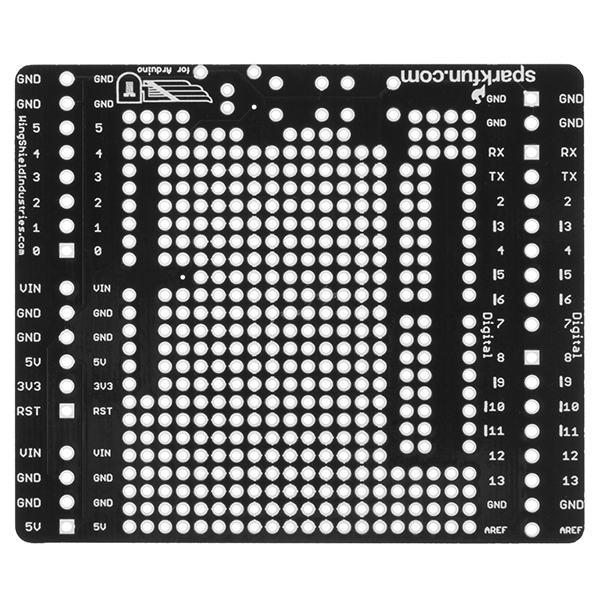 Do you plan to produce a version of the ProtoScrewShield with headers to pass through the SDA and SCL pins on the R3 Arduinos? I want to use the shield with a Mega, and I don't want to lose the A4 and A5 inputs. Just received my Protoscrew shield. I was real disappointed to find no solder pads between screw terminals and arduino pins. I don't mind cutting a trace to insert needed circuitry but I want a clean way to solder the the new circuitry in. Aren't the same pins broken out to a few pads in the proto area in the center? I found the interconnections on this board to be extremely useful; power, ground, and IO are all close enough that LEDs, DS18B20s, etc can be connected in seconds. I never looked at a doc, the connections are all drawn fairly obviously on the board. This board makes things so easy that I'm back here trying to buy one now even though I already have an empty basic shield already on my desk! I was a little bummed that the screw connections are not standard perf board size, and therefore not easily interchangable with other projects. I guess it's nice that they are big though. If you get this sheild. Be certain to download and view the Connection Diagram before you lay out anything. This board has a lot of connected pads in places you might not suspect. Be sure your using gauge 18 or 20 wires for fitting into the screw terminals. They are itty bitty and the screws are even smaller. I have to use my smallest screw driver to operate them. Lastly if you are trying to do any signal conditioning between the Arduino pins and the screw posts. You'll have to cut the traces between the screw pins and the Arduino pins. I've love most everything I've ever bought from Sparkfun, but this board is not one of them. Maybe they'll come up with a rev 2 that will be a little more real estate useful. Are there eagle files available for this board? Enjoying using the ProtoScrewShield to breakout pins not in use by a motor shield. A question about the A5 button: I'd like to have this give me an input signal on A5 and want to be sure I've done this right. I see the shield is wired so pressing the button pulls the A5 line to GND, I assume the way to get a signal on this line is to connect A5 to +5V through a 10K resistor. This works - is this the right way to do this or is there a better option? A variant screw shield that brings out all the pins of the Mega would be most welcome. If I've misunderstood something, feel free to let me know. I got and built it today, so I haven't had much time with it. And I've still to determine what the 2D interconnected area is for. A mystery. could i solder an arduino pro on top of this? You mean Arduino Pro Mini? Should work, but look out for the interconnected holes. You can actually fit two Breadboard Mini Self-Adhesive (see http://twitizer.com/AmhV1). In that case I recommend that you don't solder the LED and buttons, so the other board doesn't stick outside of the shield. disappointed a little bit. No documentation on what to solder where. not all of us read schematics. Also the board doesnt fit the UNO correctly. I mean seriously? It hits the back of the power tube and the front of the shield sticks up. It would have taken you 5 minutes to fix that before production. I will most likely return this before soldering it and buy 2 from Critical Velocity. I didnt want seperate shipping so I went with these. bad call. My CV srcew shield is great. It came with better screw thingys too. These tiny blue ones are garbage. Also its fairly obvious this is a big sheild from the pics. But man its BIG and unweildy. Lets hope the rest of my stuff is ok.
Just noting that the current version of this shield fits fine with an arduino UNO R3. It doesn't bring up the new pins however. It would be nice if at least some of the screw terminals were a larger size. Currently, there are 9 GND screw terminals... I'd gladly trade 4 of those for 2 GND's that were twice as big. The two wire pins SCL and SDA don't really matter since they are directly connected to A4/A5 on the analog side of the board. I'm not sure how you can tell that the board hits what if you haven't soldered the headers on. Arduino shields are very hard to measure if you don't actually have the headers soldered on since the boards don't actually sit all the way on the female headers. I will look into the screw terminals but these are the same we use for many of our other products without any problem. Thanks for pointing me to Critical Velocity for this. I just got my screw shield and am also disappointed in the cheap blue screw down terminals. Its going to be impossible to fit a decent sized wire into that. I love everything else I've gotten from SparkFun, but the screw terminals for this left much to be desired. I am using the screwshield for Arduino with the prototyping area in the center (not the wing shield). I was able to trace through and determine the pads that are connected but am trying to reason why you chose the pattern for connecting the pads that you did. I am attempting to place an IC on the board and it seems that I would straddle the 5V and GND pad row down the center of the board but the left side of the pins hit on the individual pads and the right side hit on the three pad group like I would expect (so I can easily make connections to the pin of the IC via the three connected pads). Should there also be a set of three connected pads for each pin on the left side also? Is there another way for placing components that is more inline with your design that I am overlooking? Help! I couldn't get this on my Free Day order, but I'll try to fit it in with my next. Everything here is through-hole, right? Also, DEV-07914 is listed twice in related products. 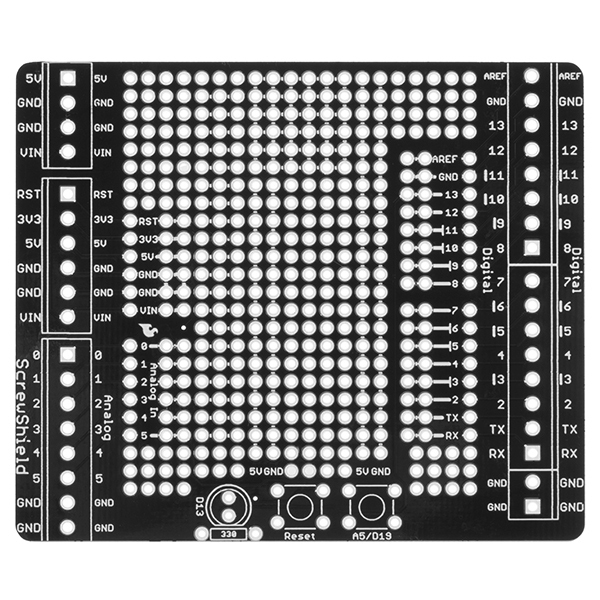 So maybe an silly question, but will the mini breadboards fit in this as well as they do for the protoshield? You can fit two, but one of them sticks out a bit if you solder the LED and buttons. Hi. Is there the pcb schematic or some sort of guide to know which pads are tied together ? Is a great shield, tied-together pads are really useful for me... but don't want to make any mistakes. The top side shows tiny bars between the interconnected holes. It looks like the silkscreen shows which holes are connected to which - though its a bit hard to see. Honestly, I'm all about using it with the mini breadboard. Cop a few of those, cheap as they are, stack it up and slot it quick when the time comes. Or get a protoboard, cut it down to size and get a few spacers on it. Quick swap in multiple in progress projects, you know? 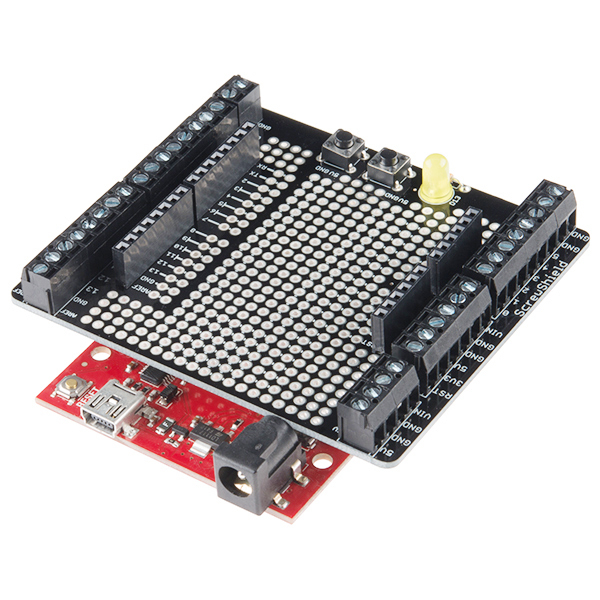 I have to say this is the first Sparkfun product I've been really disappointed with. It's a great idea but the execution here is poor, in my opinion. I bought this because I loved the wingshield version and I liked the idea of the big proto area. However, the proto area is really confusing. Almost half of the available pads are tied together in some way or another. Also, the labeling on the underside is very confusing. Admittedly, I'm pretty new to all of this so maybe this wouldn't be such a problem for a more experienced person. Either way, the proto area is not as large as it appears and is arranged such that it's difficult to place anything on it that is more than 3 holes wide. You can use a hobby knife and cut the traces between holes. It sounds hack-y but there are some prototyping systems that are built with this in mind specifically (someone help me out with a brand name). Seems a little like a special purpose vero board or strip board like. AWESOME!!! I got the original screwshield, but it was a little too flimsy for my use. Had a few ideas on soldering it on the bottom of a Duemilanove,or making a 'U' shaped support bracket. I LOVE combining it with proto area. What a great idea. Now I have to make up another order...oh well! Great for prototyping and non-permanent wiring. I bought one to replace a fairly crowded custom shield for my proton pack. This makes it easy to route the wires to the various LEDs and other peripherals, and switch them around occasionally when needed. Since it comes as a kit, I only assembled the parts I needed. I thought that I would drop in here and hopefully prevent someone from making ugly terminals like I did :o) At least on one side anyway. The little terminals are cool. They interlock.